Edgar Lungu has ordered the Zambia Development Agency (ZDA) to sale Refinery cheaply to his corrupt partners, Avic International. The PF regime which has turned Zambia into a Kleptocracy are in the process of selling Indeni. In pretence, ZDA called for public bids from organisations that might be interested in buying Zambia’s only refinery. Seven firms responded and submitted bids to buy a majority stake the 24,000 barrel per day Indeni Petroleum Refinery. Zambia Development Agency (ZDA) procurement specialist Mwila Kapita said Glencore Energy UK Ltd, Vitol SA [VITOLV.UL], China Petroleum Technology and Development Corporation and Philia Trading were among the firms that had submitted bids. But all this is just to hoodwink the public. It is Avic International that is buying Indeni. The rest of the companies are just wasting their time and money. 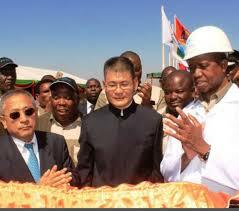 Avic International is the firm that is building property for Lungu and his family in exchange for such government deals. Indeni Petroleum Refinery was built in 1973 and is currently 100 percent owned by the state-controlled Industrial Development Corporation (IDC). Lungu is the chairman of the IDC.